GET IN FRONT OF YOUR TARGET AUDIENCE NOW! People are searching Google for services you are offering every day. Are you actually there when they need you? If you are not high enough in Google’s search results, it is very likely that you are missing out on regular enquiries and sales. The fastest and most cost-effective way to make your business visible to your potential clients is a professional Google AdWords campaign. Google AdWords places paid text ads above and below organic Google search results for maximum visibility. 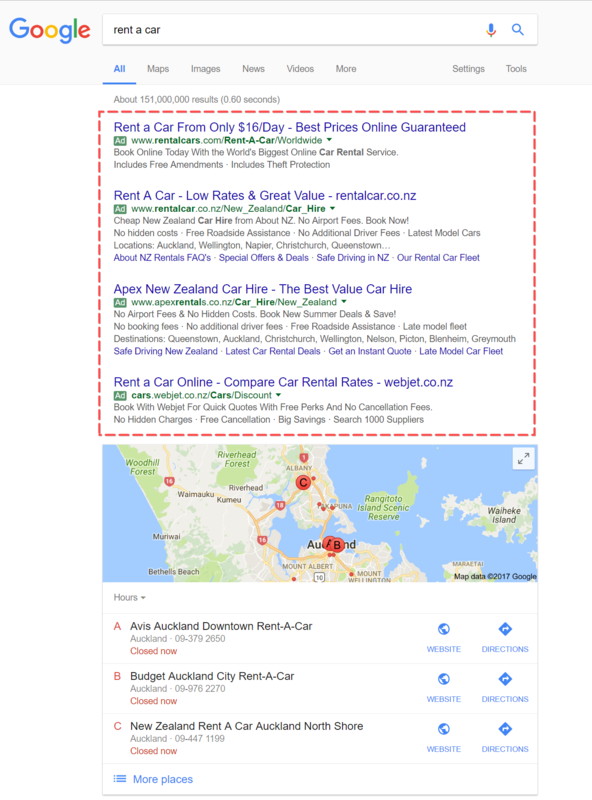 AdWords can quickly get you to the top of search results for your keywords nationally, internationally or locally, depending on your business requirements. The positioning of the text ads is determined via a Google auction. The auction is a complex process influenced by many factors. Simply put, your ad’s position is higher if you are ready to pay more for a click and if your ad is of a high quality. Our certified Google specialists will make sure your ad spend is optimised to deliver maximum number of clicks with minimum budget. There are factors outside a Google campaign that can influence its outcome. These factors include your website performance, your customer service and offer strength. We will analyse your website and give advice in case it needs some touch ups to make sure it converts leads gained through Google AdWords into customers and profit. Our AdWords packages offer fully-managed AdWords solutions for small and medium businesses in all niches. The packages cover a one-off setup and a monthly management fees. What’s Included in Monthly AdWords Management Fee? The monthly management fee covers campaign tuning to maximise performance, negative keywords analysis, ad performance adjustments, monthly reports. Our AdWords packages offer fully-managed AdWords solutions for small and medium businesses in all niches. The packages cover a one-off setup fee and a monthly management fee. * There is no setup fee if you order website design package with us! What’s Included in One-off AdWords Setup Fee? The setup fee covers niche and competitor analysis, campaign research, strategy development, in-depth keyword research, campaign structuring (ad groups), ad copywriting, bidding strategy development, Google Analytics setup, $100 ad spend voucher. Thanks to the team at Express Web Studio for our website and Logo. Excellent communication and really quick responses to all our queries. I highly recommend to any business that needs a website. These designers sure know how to design something. I had minimal contact with them and with what they designed is just mind blowing from what they were given. Recommended to any company. Great work guys!! I got an amazing website! So much better than it was before. These guys are very reliable and easy to deal with. Recommend their services to everyone who wants to get a functional and good looking website! Express Web Studio are easily the best value web designers around and without compromising on quality. One thing I really like is that they have always taken the initiative where my design notes are weak and they have presented great ideas. Recommend. Easy communication & explanation, immediate contact, great job and as a result - an amazing website. I will definitely recommend your service. Thank you very much! You have to use this company, thats all I can say! They did my whole website for my business in under 2 weeks and I am so happy with it. My sister company in The USA said it is better than their website! I am blown away with the service , price and quality. Thank you so much!!!!! This company did our website for www.ahcts.co.nz Was done fast and so amazing, it has also increased traffic to our website. Thanks so much. I can't say enough about Alex and his team. My shopping experience has been a dream, and a real surprise, I never expected this high level of service. Every part of the process was faultless, great communication, great design and Alex got me on the first page of Google...what more could you want? Do yourself a favour and contact Alex, you won't be disappointed....you'll be over the moon! Thank you so much for such a wonderful website. It was a daunting task ahead with so many ideas and you guys manage to not only understand what I wanted but also exceeded my expectations in achieving it all. I love the project manager, client invoicing, private online galleries, the design and well everything on our website! Its just one amazing package and the extra's was well worth it! Thank you again. Contact us now and start making more money with increased traffic, higher conversions and a solid ROI! How did you find about uspick one! Copyright © 2019 Express Web Studio Ltd. All Rights Reserved.